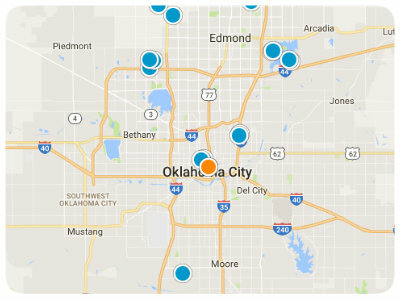 To see all homes for sale in Oklahoma City, search above. Once rough and rowdy, Oklahoma City was a part of the Great American Frontier. Although the territorial frontier days are gone the area and its inhabitants retain a lively independent spirit. The state of Oklahoma has remarkable variety with regard to its landscapes, complete with soaring vistas, lush hills and expansive prairies. While some may conjure up images from Steinbeck's Grapes of Wrath, picturing wind-worn faces on a dusty plain, this is a stereotype Oklahoman's have long overcome, though not everyone may be aware. 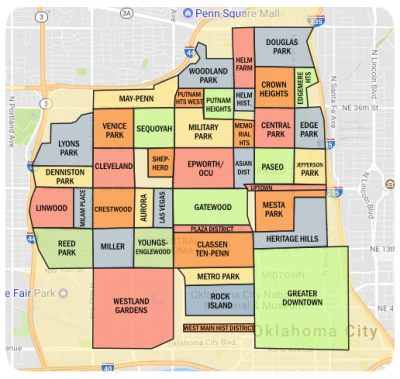 An interesting part of the current landscape is the division of land within the Oklahoma City metropolitan area. There are a number of small cities embedded in such a manner as it can be difficult to discern where exactly one is, unless consulting a street sign. The city's use of color combinations is the best clue to know if you are still in Oklahoma City or in say, Bethany or Nichols Hills. Though not crucial for the purposes of transiting the region, as the entire area blends together seamlessly, when interested in exploring Oklahoma City, OK homes for sale buyers are certainly going to want to know where they are looking. Of course, the minor confusion this system may cause is well worth the remarkable diversity the city imparts. Not unlike the state itself each area is noteworthy. One example is Bricktown, originally a warehouse district, the city has transformed the neighborhood into a vibrant entertainment district. The effect the combination of warehouse type structures with public art and sculpture is terrifically unique and appealing. While this example is in a commercial area, residential neighborhoods can be equally fascinating. Oklahoma is a land of great contrasts. Oklahoma City is too, a place where western charm collides with metropolitan flair. The city has a personality that is at once down to earth and relaxed and yet fantastically chic. Art and culture hold an equal importance to sporting events and outdoor recreation. This notion is evidenced by the city's support of the Historic Paseo Arts District. First developed in 1929, it is the oldest arts district in Oklahoma City and home to seventeen galleries and more than sixty artists. The area is thriving with restaurants, a coffee house, boutiques and a theatre all interspersed among the galleries. Supported by the Oklahoma City Arts Council whose mission is to improve the essential quality of residents lives through cultivating the arts, both the Philharmonic and the Ballet add a note of refinement to the city's plentiful offerings. Of course, the rich western heritage of the area has not been lost within the cultural landscape. This heritage is preserved in a whole host of ways, particularly throughout the city's Adventure District on the northeast side of town. This is where the National Cowboy and Western Heritage Museum is located along with the Oklahoma City Zoo, Remington Park, the ASA National Softball Hall of Fame and the Science Museum of Oklahoma. The success of each of these areas of interest signals a thriving and growing economy which makes real estate in Oklahoma City, OK extremely desirable. The unemployment rate is a low 4.5%, and in some of the outlying suburbs it is even lower. Job growth is positive and continues to increase. The area is also home to many institutions of higher learning, there are forty-three colleges and universities in the state. The state's high value on education is shown through its promise to provide scholarships to its most needy citizens. Long-time residents and newcomers recognize Oklahoma City's future as dynamic, smart and growing. Why not make it your future as well?